The ability to adapt is what helps a species survive. A dwindling food supply, changes in the environment, and a shift in the climate are all harbingers of extinction except for those few who can acclimate to the changes. If the sun is too hot, take to hunting at night. If the air is cold, grow fur. If the hunters are big, become bigger. Life can be tough, but survival is even tougher. Evolution: Climate, designed by Dominic Crapuchettes, Dmitry Knorre, Sergey Machin, and to be published by North Star Games, is comprised of 177 Trait cards, 240 Food tokens, 20 Species boards, 40 wooden cubes (for tracking purposes), 6 Food token bags, 1 Climate track, 1 Climate marker, and 1 rather large Dino start token. As this is a review of a prepublished game, I cannot comment on the component quality. However, the game itself will be published to the same standards as the previous Evolution games and includes the fantastic artwork by Catherine Hamilton. Note: Evolution: Climate is a stand-alone game. It is, essentially, Evolution with additional rules and game components, using the Evolution game rules as a system on which the new game is built. A player need not have Evolution to play Evolution: Climate. In fact, having both games would be overkill. 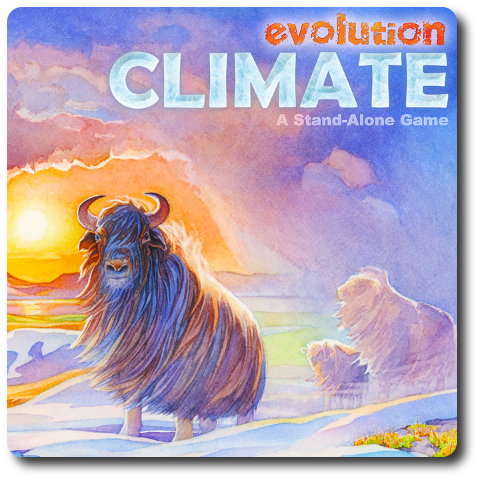 For those who already own Evolution, a conversion kit is available that is added to the Evolution game and changes it to Evolution: Climate. Evolution: Climate uses almost all of the Evolution game rules. We have already fully reviewed and explained how Evolution is played, so we will not cover much of the game play here. Instead, we will focus on what is new, so as to make it clear what the game provides in addition to the base game on which it’s built upon. For teaching purposes, if players already know how to play Evolution, then teaching Evolution: Climate will take less than 10 minutes. Trait cards, Food tokens, and Species boards are used in the same manner. The biggest difference are the effects and abilities of some of the cards and the Climate track, which I will discuss in detail. If players are not familiar with Evolution, teaching Evolution: Climate will take longer, but is not any harder than teaching Evolution. Game play is still intuitive. Game set up is almost identical to Evolution, with a few exceptions. First, find and place back in the box “Burrowing”, “Defensive Herding”, and “Ambush” Trait cards. Second, shuffle in the new Trait cards from Evolution: Climate with the base game’s Trait cards (minus those you just removed). This new set of Trait cards includes updated versions of the Trait cards. Third, randomly remove 30 Trait cards (or 40 Trait cards if only playing 2 players) and set them aside, face-down. These cards are used towards the end of the game. Fourth, place the Climate track in the middle of the game playing area. Place the Climate marker on the “Start” region (Temperate). The rest of the game set up is as described in Evolution. Other than the new effects and abilities provided by the Trait cards, the following new rules are to be followed. Each player is dealt 4 Trait cards, plus 1 additional card per Species they currently have. The Climate track is rightfully at the center of game play. This track will impact all the players differently depending on how each player has evolved their Species. Trait cards come into play here and will help a player’s Species survive or quickly perish. There are 15 regions on the Climate track. Each region represents the current climate in a general sense and from one extreme to another. At the far left extreme is the Ice Age and at the far right is scorching temperatures. In the middle is a Temperate region where the conditions are “just right”, as Goldilocks would say. Between the two extremes are 13 regions that shift the climate to cooler or hotter temperatures. Out of the 15 regions, 12 will reduce the population of specific Species of a particular Body Size value, except in the case of the two extreme climates that effect all Body Sizes. Heat reduces the population of the larger species and the cold reduces the population of smaller species. The only silver lining here is that the reduction in population happens before the player has to find food to feed their Species. 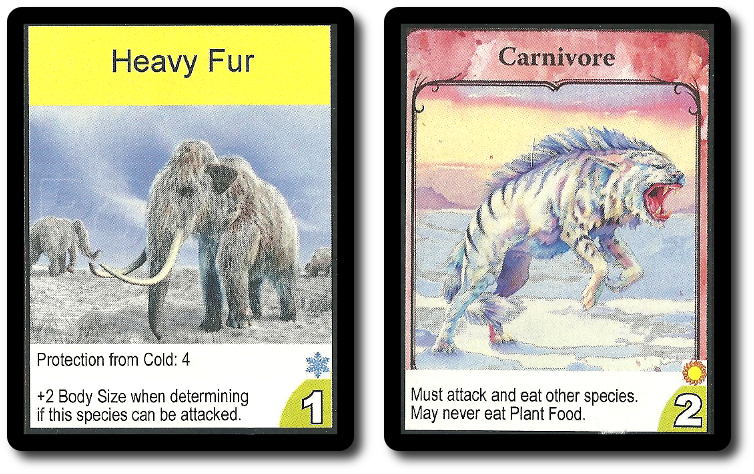 Climate also impacts overall plant Food tokens available from the Watering Hole board, which is modified before the players can feed their Species. If the climate is colder, the number of plants are reduced. In warmer climates, plants are plentiful. This is, of course, bad news for the plant eaters, but it also spells trouble for the meat eaters who feed on the plant eaters. During the extreme climate changes, plants hardly grow at all and everyone starves. Evolution: Climate includes many of the same Trait cards as Evolution, but includes new icons and specific effects and abilities meant to counter difficult climates. For example, protection from the heat or from the cold, which allows Species to endure extreme temperatures. Hibernation can now be used to save Species from starving during food shortages. It won’t save all of a Species, but it will keep enough around to avoid extinction. New Traits can also make Species unavailable to predators. Species that are nocturnal can avoid predators by moving about at night. However, smart predators can still hunt elusive prey by simply outwitting them. Trait cards are powerful and they can be combined with other Trait cards to bring about some truly unique Species that just might be hardy enough to survive. When the Trait cards placed by the Watering Hole are revealed, the amount of food that is provided is calculated (by adding the number values in green), but not before determining the shift in the climate. New to Evolution: Climate are Sun and Snowflake icons above the Food numbers. These are used to determine if the climate shifts and in what direction. If the total number of Sun icons is greater than the Snowflake icons found on all the Trait cards at the Watering Hole, the Climate marker is shifted 1 region towards Scorching (to the right). If the Total number of Snowflake icons is greater than the Sun icons found on all the Traits cards at the Watering Hole, the Climate marker is shifted 1 region towards the Ice Age (to the left). If there are an equal number of Sun and Snowflake icons, the Climate marker does not move for the round (which may or may not be a good thing). As soon as the climate for the round has been resolved, players must reduce their total population for those Species that are impacted by the shift. Trait cards come into play here and can protect Species from the elements, regardless of their size. Once population has been adjusted, the amount of plant food for the round is determined. All the Food number values provided by the Trait cards are added together. The climate region will either increase the resulting number or reduce it. Any reduction is first subtracted from the total value provided by the Trait cards and then taken from the Watering Hole board. At this point, the game is played as described in Evolution. The game can end one of two different ways. Both are triggered when the Trait draw deck is exhausted. Instead of shuffling the cards in the discard pile, the Trait cards that were set aside during game set up are used. If the Trait draw deck is exhausted during phase 1 of the round, the game ends when the round is completed. If the Trait draw deck is exhausted any other time during the game, the game ends when the next round (not the current round) is completed. When the game ends, players count their points. Each player earns 1 point for every Food token in their Food token bag. Each player earns points equal to all their Species board Population values. 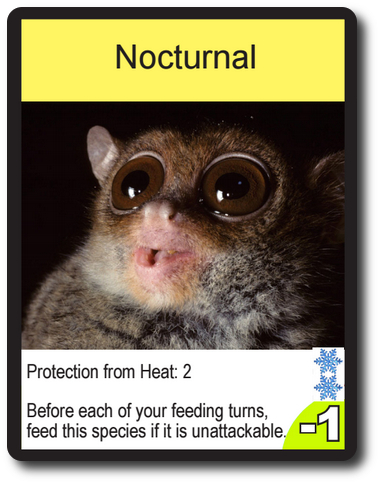 Each player earns 1 point for every Trait card attached to a Species board. The player with the most points wins the game. Ties are broken by determining which player has the most Trait cards. To learn more about Evolution: Climate, visit the publisher’s website or visit the Kickstarter campaign. The Child Geeks had no problems learning Evolution: Climate. We introduced the game to a few players who had never heard of Evolution and again found that the game is very easy to teach. The Child Geeks took right away to creating different Species, but had difficulty adjusting to Climate changes. According to one Child Geek, “You have to watch the Climate track really closely because it will always tell you what will happen and what might happen.” The Child Geeks quickly caught on that the Climate marker moved because they collectively said it should. As one Child Geek said, “As soon as you realize that the Climate marker will move based on what players play, you have a lot more control.” I wouldn’t go so far as to say any one player has control, but they most certainly have a say. Speaking of which, all the Child Geeks said that Evolution: Climate was a great game. The Parent Geeks also enjoyed it, really liked that climate impacted species, and found the new game direction to be superior to the original version. One Parent Geek said, “As an educator, I really like this new Climate tracker. It really brings the message home that both people and animals are impacted by the climate.” Another Parent Geek said, “The Climate track introduces a lot more strategy and tactics. I have to think more about what I will add to the Watering Hole, what Trait cards to use, and what situations I need to prepare for.” A few of the Parent Geeks thought that the Climate track made the game feel a bit long and a bit chaotic at times, but never to a point where it hurt the game. All the Parent Geeks gave Evolution: Climate their full approval. The Gamer Geeks were most pleased. According to one Gamer Geek, “Evolution was just about perfect. The Climate track doesn’t make it perfect or fix some of the issues I have with the game, but it does make the game much better.” When I pressed for more information on what was made better, the Gamer Geek said, “The players now directly impact the game for everyone, not just for themselves.” Another Gamer Geek said, “I wish there was a way we could move the climate faster, but I guess the way it currently moves now – slowly – is pretty true to life and gives everyone an opportunity to consider what actions they should take.” All the Gamer Geeks found Evolution: Climate to be a better version of the game and fully approved it. I liked Evolution: Climate more than Evolution, too. Don’t get me wrong, Evolution is a fantastic game that continues to draw me to the table. I didn’t think Evolution was lacking anything until I played Evolution: Climate. Having to contend with the climate created a new level of strategic game play. It influenced how much food I put into the Watering Hole, what Traits I selected, and what risks I took. Interestingly enough, the climate plays a big role in the game, but it’s in the background. It influences, but does not directly dictate. Players still have all the control, including adjusting the climate. It’s the ability to adjust the climate that was enjoyed by many. By adding specific Trait cards to the Watering Hole, players could hope to move the Climate marker one way or the other. The changes are always small, but they start to add up. Players must adapt or risk losing their Species and the game. Climate tipped the balance in some games and caused chaos in others. It’s not simply enough to react to climate changes. One must plan for them. If I were asked which version of the game one should get, I’d first ask if the player had Evolution. If they did, I’d suggest they get the conversion kit that would make their Evolution game into Evolution: Climate. If the player did not have Evolution, I’d tell them to jump right to Evolution: Climate. It’s just a better game. My one concern is that I do not fully understand at this point how Evolution: Flight would work. Then again, flying Species are impacted by the climate just as much as any other Species, albeit in different ways. The only thing we are missing now is an Evolution game that deals with the ocean. Until then, do play Evolution: Climate. It’s everything Evolution is, but better. It’s “evolved”, you might say. Tagged Animal Games, Card Games, Child Geek Approved, Educational Games, Environmental Games, Father Geek Approved, Fighting Games, Gamer Geek Approved, Parent Geek Approved, Prehistoric Games, Prepublished Games. Bookmark the permalink. Very clear and informative review, as always. In your last paragraph, you refer to using Climate and the earlier Flight expansion together. Dominic the designer has just posted about this over on Kickstarter. He doesn’t recommend it, but reasons that people will going to combine expansions anyway, so he might as well provide some guidance. This is good news and not surprising. I believe it to be a valid assumption that an expansion designed for the base game could also be used with another game that uses parts of the base game. Wait…did that makes sense? Yes, it made sense…kind of. The point is, I am very pleased to see North Star Games calling attention to it and providing guidance. Thank you very much for passing along this information, Andrew!